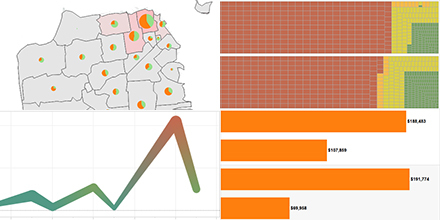 The San Francisco Ethics Commission has released new campaign finance dashboards to track campaign contributions and expenditures in the November 3, 2015 election. The interactive data visualization summarizes financial activity by candidate and ballot measure committees, contributors, lobbyists, and third-parties. It also tracks public funds disbursed to candidates through the City’s public financing program and the expenditure ceilings. The disclosure data used to compile the visualizations are available for download from the Ethics Commission or SF OpenData web sites.